Pottery is thought to have existed since the time of early humans. In historic sites, has found many ancient pottery that serves as home furnishings. Ceramic pottery that is also. But it is usually interpreted ceramics using low-burning, high water absorption, for example, bricks, jars, pots, tile house. Pottery-producing area known as the Kasongan. 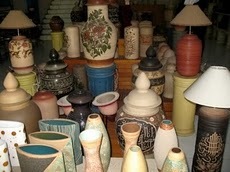 Actually a lot of pottery producer in Indonesia. Can often be found in the villages and carried out by one family is also close neighbors. Because his motives are never changed, for example maker jars, pots, mortar once it's cheap. But if given a touch of art will add value. Raw materials for making pottery is very simple, only clay and fine sand. Clay is dried first, then destroyed and filtered. Comparison of the material varies from the high plasticity of the clay used. Some are wearing comparison clay: fine sand = 1: 2 or 2: 3. Mixing, dry clay that has been filtered is mixed with sand in the ratio mentioned above, stirring until blended as if mencampu sand and cement. Then poured a little water while stirring with a can be formed. Way of formation, there are several ways, namely using a rotary tool, to make flower vases, pots, pans. Directly formed by hand with a twisted way, to make the statue, ashtray etc.. The burning of earthenware many wearing traditional combustion techniques, such as I have ever seen, made his home yard hole like a hole to dispose of waste if the village, pottery items that have been laid out in a dry hole, on top of stacked and burned There also are used the method of burning tiles. Fuel wood use. Long burning between 7 to 9 hours. below I've included a picture waiting for pottery. Finishing. After the burn, pottery decorated with regular paint, there is also wearing duco paint to paint the car, there is also wearing metallic paint.